Preprints (earlier versions) of this paper are available at http://preprints.jmir.org/preprint/3835, first published Sep 02, 2014. Since the 1950s, researchers have understood the importance of physical activity in promoting health . An active lifestyle is now understood to reduce both the morbidity and mortality of a wide range of chronic diseases ranging from cancer to cardiovascular disease . Insufficient levels of physical activity are responsible for 6% of global mortality and are the fourth leading cause of death around the world . While the health importance of physical activity is well established, recent evidence suggests that sedentary behavior (eg, activities done while sitting)  also plays an important role in the development of chronic disease. For example, sedentary behaviors are associated with adverse health effects, including undesirable changes in cardiometabolic markers, vascular, bone, and psychosocial health independent of exercise [5-8]. This is important, given that it is possible to accumulate high amounts of both sedentary and exercise behaviors during a single day [6,7,9-11]. Further, the proportion of time spent in sedentary behavior dwarfs that spent in physical activity. For example, Canadian adults spend roughly 70% of their waking hours engaging in sedentary behavior, while just 3% engaged in moderate or vigorous physical activity . Not surprisingly, recent studies have estimated that sedentary behavior may reduce the life expectancy of Western nations by 1-2 years [13,14]. Given these important differences, researchers have recently argued that sedentary behavior should be viewed as an independent and distinct construct, rather than simply the lack of physical activity . Further, it has been shown that sedentary behavior and physical activity have independent and distinct relationships with health. The knowledge-to-action framework from Graham et al  highlights the multifaceted nature of knowledge creation and implementation. Knowledge about the health effects of prolonged sedentary behaviors has been generated (ie, the knowledge creation cycle). However, a gap exists in understanding how this information is being implemented to impact the health of lay users (ie, the knowledge utilization cycle). In North America, the Internet is a primary source of health information, with more than half of users seeking health information online [16-18]. Previous evidence has reported that over half of American and European citizens have used the Internet to seek health-related information . Online mediums may help to bridge the research to action gap by allowing evidence-based information to freely reach the homes of a broad spectrum of users. There is a growing trend in the literature reporting how social media can facilitate knowledge sharing and collaboration . YouTube is among the top three most popular websites visited around the world, with more than 4 billion videos being watched by users daily [21,22]. The primary concept of social media sites like YouTube is the sharing of media content between users . Videos allow for the sharing of complex ideas in a simple format . The Health Care Social Media List form the Mayo Clinic identifies over 700 health-related associations in the United States that have established a presence on YouTube . A strength of the social media format for knowledge translation is its capacity for timely updates, in contrast to the slow uptake and evolution of information shared through traditional peer-reviewed formats . However, there is a lack of regulation on the content available through YouTube. Previous research has reported that misleading information posted through videos on YouTube could endanger viewers . There is a growing body of evidence exploring health content available through YouTube. Research has identified that health-related videos posted to YouTube may contain erroneous and potentially harmful health information [20,22,25]. As knowledge about the health risk of sedentary behavior transitions from research to practice, there is value in understanding if the information available on YouTube is evidence-based. Therefore, the purpose of this project was to identify sedentary behavior content on YouTube and describe features of this content that may impact the effectiveness of YouTube for knowledge translation, such as evidence-informed messages and description of video characteristics. Understanding what information is currently available may help researchers tailor their messages to promote more effective knowledge translation and uptake. YouTube was searched on a single day (May 25, 2014) by 3 independent reviewers (EK, BI, AM). Computers were set to “incognito”/“worldwide” to limit any filtering by the site to previous user data and to help ensure that search results would not be limited to local country of searching but instead include videos from around the globe. Similar to the methods of Williams et al , Google AdWords  was used to search keyword phrases frequently used by the public when searching Google in relation to “sedentary behavior” to develop a list of popular phrases for the topic that could be searched on YouTube. Subsequently, three keyword searches of YouTube were conducted (“sedentary behaviour”, “sedentary behavior”, and “sedentary lifestyle”) as well as a category search of the YouTube-generated “sedentary lifestyle” topic channel. Currently, YouTube algorithms create topic channels based on volume of content on the site, in the present case linked to the keyword phrase “sedentary lifestyle”. The channel’s main page presents three popular videos sorted by relevance to the topic channel for six subcategories: (1) popular sedentary lifestyle videos, (2) popular sedentary lifestyle and health videos, (3) popular sedentary lifestyle and physical exercise videos, (4) popular sedentary lifestyle and obesity videos, (5) popular sedentary lifestyle & lifestyle videos, and (6) popular sedentary lifestyle and childhood obesity videos. For each of the four searches (three keyword, one topic channel), results were sorted by both relevance and views using the YouTube search features, and the first two result pages (approximately 40 videos) were assessed. The goal of the search process was to identify YouTube content that users are accessing the most. Searching was limited to the initial two pages of results based on the following a priori criteria: (1) saturation of the topic becomes evident in most cases by the end of the second page at which point search results are obviously not related to the search phrase, and unlike the searching process employed in systematic reviews, (2) typical YouTube users may be less likely to continue scanning results past the initial two pages of results, especially when videos appear not to be linked to the search phrase. Videos were excluded if they were not available in English or portrayed content obviously not related to the search (eg, music videos, product advertisements). Additionally, individual users’ channels that were generated in the search results were not reviewed, as they contained multiple videos posted by the user with varying relation to the desired search content. Video data were coded into an electronic spreadsheet and analyzed in June 2014. For each video, we collected both objective data (video title, URL, number of views, number of shares, the length of the video, number of comments posted by YouTube users, descriptive text and keywords that the user who uploaded the video included, and the YouTube category used to classify the video) and subjective data (the purpose and source of the video, and the type of activity content included in the video). Textbox 1 defines coding themes used for subjective data. To ensure consistency in coding, a representative video from each search was coded collaboratively until consensus was reached. Descriptive statistics were performed to understand the context of evidence available on YouTube. Specifically, there was interest in understanding if the information available on YouTube represents best evidence for sedentary behavior, if users are seeking information on sedentary behavior through this medium, and describing video content in terms of who is producing the video to help inform future initiatives for leveraging YouTube as a knowledge translation vehicle. To explore the descriptive statistics by popularity of content on the YouTube site, interquartile range of view counts were used to group videos based on number of views. Pearson correlation coefficient (r) was calculated to explore the relationship between views, keyword search, video length, video source, and activity classification. Statistical significance was set at P<.05. Textbox 1. Definition of coding themes for subjective data extraction. Figure 1 shows the search results. The initial search yielded 232 videos. After removing ineligible and duplicate results, data were analyzed from 106 videos. Table 1 summarizes the included videos. The location of the uploader was not discernable via the YouTube site. Therefore, an independent online database (YouTube Stats ) was used to search the country of origin for videos. It should be noted that the database provides only a source of origin for videos with >4 subscribers; therefore, it did not provide a complete source for origin of all videos in this sample (Table 2). Figure 2 shows the distribution of videos around the globe and demonstrates a substantial representation of content from North America. Table 2. Location of origin for videos (N=106). Figure 2. Global distribution of search results. 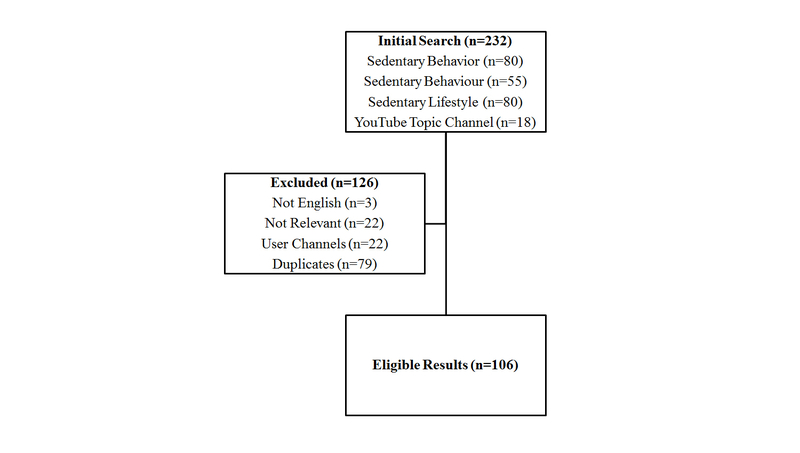 The four search phrases (“sedentary behavior”, “sedentary behaviour”, “sedentary lifestyle”, and YouTube topic channel) and two search methods (sorted by relevance or views) generated 58.5% (62/106) duplicate results. Of the results that were unique to a single search phrase (41.5%, 44/106), “sedentary lifestyle” generated 65.9% (29/44), “sedentary behaviour” generated 20.5% (9/44), and “sedentary behavior” generated 13.6% (6/44). Table 3 presents the means and interquartile ranges of video views, length, time since uploaded to the YouTube site, and quantity of comments posted by users. There was no relationship between number of views and video length (r=-.10, P>.05), or the search phrase (r=.08, P>.05). Similarly, no relationship was evident between search phrase and the source of the video (r=-.05, P>.05) or the activity type presented in the video (r=-.09, P>.05). Table 3. Descriptive features of video results (N=106). Videos that portrayed content on sedentary behaviors alone represented 37.7% (40/106) of the results. Videos that portrayed a combination of sedentary and physical activity behaviors represented 31.1% (33/106) of the sample, and videos that portrayed physical activity behaviors alone similarly comprised 31.1% (33/106) of the sample. Videos with the highest view counts (ie >240 views) portrayed physical activity behavior content, not specifically sedentary behavior content (Figure 3). Figure 3. Activity type portrayed in videos by interquartile range of views. 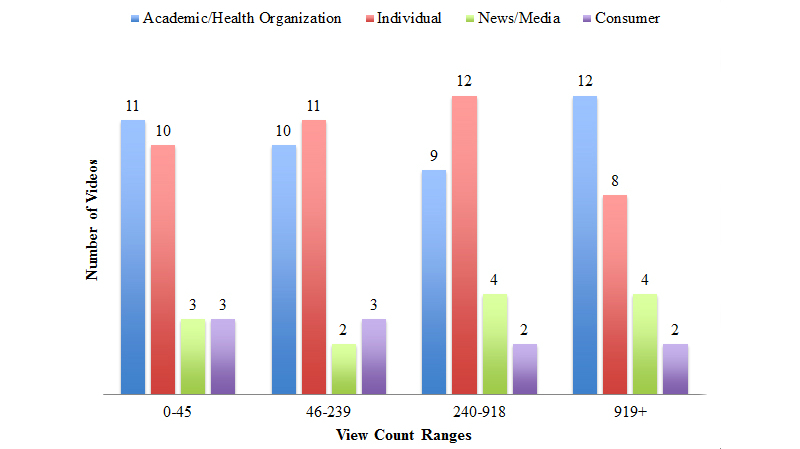 Academic/Health Organizations and Individuals were the most common source of content, representing 39.6% (42/106) and 38.7% (41/106) of videos, respectively. News/Media comprised 12.3% (13/106) of the videos, and 9.4% (10/106) of videos were Consumer. The trend was similar across view count ranges (Figure 4). Figure 4. Source of videos presented by interquartile range of views. The predominant purpose of videos was coded as Educational (71/106, 67.0%). Academic presentations (16/106, 15.1%) and Opinions (14/106, 13.2%) contributed to a smaller portion of the available content. Minimal videos (5/106, 4.7%) were Consumer-based, aiming to sell products or services. Moreover, Educational videos were more dominant across all view count ranges (Figure 5). Figure 5. Purpose of video presented by interquartile range of views. YouTube is a popular social media site that facilitates the sharing of content, evidence-based or otherwise, with a large body of users. The purpose of this study was to explore descriptive features of sedentary behavior content on YouTube to enhance future knowledge translation efforts of evidence-informed sedentary behavior content. Results from 106 sedentary behavior videos demonstrate that content is being uploaded from around the world, which further underscores the value of this medium as a way to link the global community. Moreover, these results may underestimate the global reach of content via this social platform due to eligibility criteria from this study excluding videos not available in English. Google AdWords  was used to generate a list of search phrases common to Internet users. The search phrase “sedentary lifestyle” generated more unique search results on YouTube than the other search phrases. However, no relationship was evident between search phrase and either views or source of the video. These results suggest that certain key terms are more prevalent on the site, yet this does not appear to impact viewership of sedentary behavior content on this social media platform. To help design the future development of sedentary behavior content for YouTube, our investigation explored the relationship between length of videos and view counts. There was no relationship, suggesting that length of video does not impact the viewership. Therefore, knowledge translation efforts may need to consider aspects other than length of videos in order to increase viewership. User-generated comments on videos represent the interactive and collaborative nature of YouTube content. The videos included this analysis had generated very few comments on the YouTube site (Table 3), which may indicate that sedentary behavior content currently on YouTube is not generating discussion and collaboration among users. Similarly, there were a remarkably low number of shares for sedentary behavior videos, indicating that users are not engaging in further social features of the YouTube site to enhance the reach of sedentary behavior content. Moreover, view counts can be used to compare popularity of content on YouTube. Typically, popular videos on the site generate hundreds of thousands to millions of views. The median view count of sedentary behavior videos was 239 (Table 3), which suggests that the sedentary behavior content posted to the site is not popular among users. This presents a substantial opportunity for sedentary behavior researchers to improve the reach and impact of evidence through this social platform. In the past, the term “sedentary” was often used to refer to individuals who were not sufficiently physically active [4,29]. However, as noted above, available evidence suggests that sedentary behavior and physical activity should be viewed as separate and distinct constructs [4,30]. Thus, a growing number of researchers have suggested that the term “sedentary” should be used only to describe sedentary behaviors (eg, activities done while sitting), as opposed to the lack of physical activity . Despite the widely used academic definition of sedentary behavior as activities characterized by sitting, approximately one third of this sample of videos displayed content on physical activity, not sedentary behaviors. Further, videos with higher view counts tended to portray information on physical activity, not sedentary behaviors (Figure 3). Finally, there was no relationship between search phrase and the type of activity behavior presented in the video (ie, sedentary behavior, physical activity, or mixed). These results further underscore the confusion between physical activity and sedentary behavior, which may impact knowledge users’ understanding of both the behaviors themselves and the associated health outcomes of these distinct behaviors. The source and content of information is variable in this medium. There is currently a lack of standardized tools for assessing quality of content on social media sites like YouTube. Unlike systematic reviews of traditional evidence, a gap exists in the literature describing an evidence-based quality assessment tool for the purpose of reviewing social media content. Moreover, previous research has highlighted concerns about the regulation of content available online. For example, one study that examined YouTube for evidence-based immunization content found that videos containing information that contradicted public health guidelines on the topic of interest were more likely to receive high view counts and user ratings and accounted for more than half of YouTube content on the topic . Moreover, another study that examined YouTube for video content on eating disorders found that one third of videos glorified the unhealthy behaviors, and that these videos were more likely to have higher view counts than videos that discouraged the behavior . These findings may further underscore the importance of the research community leveraging the popularity of YouTube as a knowledge translation vehicle to promote evidence-based information. While YouTube is accessible around the world, and results from this study demonstrate content being uploaded from across the globe, many workplaces and educational institutions restrict user access to social media sites like YouTube. Restricted access may limit the impact of this medium for translation of evidence-based information to users. Research demonstrating the cultural value of YouTube [31,32] in conjunction with the potential of the social platform for sharing evidence-based content may be of value for informing the future development of policies governing access to social sites like YouTube. While physical activity is a well-established research domain, the focus on sedentary behavior research is much more recent. Therefore, many information seekers are not only unaware of the health consequences of prolonged sedentary behaviors, but also of the distinction between “too much sitting” and “not enough exercise”. Moreover, there is a shortage of evidence describing the implementation and translation of evidence-based sedentary behavior information into lay landscapes, which could further impede an individual’s understanding of this health risk. Our study explored sedentary behavior content available on YouTube. 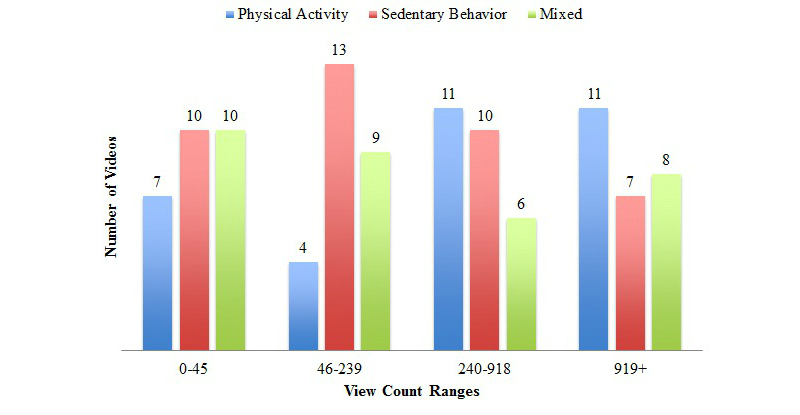 Findings demonstrate that there is confusion between physical activity and sedentary behaviors, that content is being uploaded to the site from around the globe, that content is primarily from health organizations and individuals with the purpose of educating fellow users, but that low views and comments suggest that sedentary behavior content is relatively underutilized on YouTube. Future research may wish to leverage social platforms, such as YouTube, to facilitate implementation of evidence-based sedentary behavior content. EK is supported by a Canadian Institutes of Health Research Doctoral Research Award. Sponsors had no role in the development of this project or the submission of this manuscript for publication. EK contributed to research design, implementation, data collection, data analysis, and manuscript preparation. BI contributed to data collection, analysis, and manuscript preparation. AM contributed to data collection, analysis, and manuscript preparation. TJS contributed to research design, data analysis, and manuscript preparation. All authors approved the manuscript for publication. TJS was the creator of one of the videos included in this analysis. Global Health Recommendations on Physical Activity for Health. Geneva: World Health Organization; 2010. Dunstan DW, Healy GN, Sugiuama T, Owen N. Too much sitting' and metabolic risk - Has modern technology caught up with us? European Endocrinology 2010;6(1):19-23. Colley RC, Garriguet D, Janssen I, Craig CL, Clarke J, Tremblay MS. Physical Activity of Canadian Adults: Accelerometer Results from the 2007 to 2009 Canadian Health Measures Survey. Health Reports 2011;22(1):1-8. ©Emily Knight, Brittany Intzandt, Alicia MacDougall, Travis J Saunders. Originally published in the Interactive Journal of Medical Research (http://www.i-jmr.org/), 20.01.2015.